Total estimated investment in the convention/exposition campus is estimated to exceed $26 million. 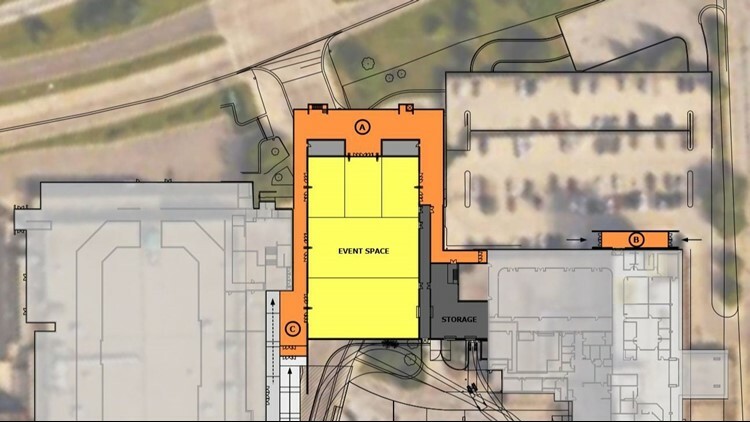 MUSKEGON, Mich. – Community members in Muskegon are getting a look at a $17 million convention center planned for the space between the Holiday Inn Muskegon Harbor and the LC Walker Arena. Monday Oct. 22, officials with the city of Muskegon and Muskegon County released new images of what the convention center should look like. A public/private partnership seeks to create the convention center on 4th Street between Western Avenue and Shoreline Drive, and the city’s LC Walker Arena and hotel. It will have entrances at Shoreline Drive, Western Avenue, and 3rd Street, with additional access through the hotel and arena. Renovations to update the LC Walker Arena were just recently completed. The city will vacate 4th Street for the convention center development. "But it stays open to pedestrian traffic," says Frank Peterson, Muskegon City Manager. "There is still a pedestrian walkway that goes from Western down to Shoreline Drive." The public/private partnership between the County of Muskegon, City of Muskegon, and Parkland Properties of Michigan. Parkland Properties which owns the Holiday Inn Muskegon Harbor is investing $6 million in renovation at the 201-room hotel. The main goal of the convention space will be to attract visitors to town. "In the fall, winter, and early spring we want to invite people into Muskegon," says Peterson. Visitors will likely be part of small to mid-size regional and state-wide organizations holding annual events and meetings. In the summer the convention space will likely host weddings, receptions and unique special events. "Just to meet the needs of the types of event that have tried to come to Muskegon but haven't been able to," says Peterson. The convention center portion of the project will be funded with county accommodations taxes and assessments collected from hotels located within the City of Muskegon. According to a press release "Some 20,000 sq. ft. of divisible clear-span space and an expansive pre-function area overlooking Muskegon Lake will be supported with over 10,000 sq. ft. of breakout and banquet facilities at the hotel and in the lower level of the convention center building. The design of the building takes its cues from the city’s industrial past and expansive waterfront, and will capitalize on its location in the heart of the city." The City of Muskegon will host a free event for the public to give community residents a closer look at the newly renovated arena and a preview of the convention center plans on Tuesday, Oct. 30 at 5:30 p.m. at the LC Walker Arena. For additional information on the event, contact the City of Muskegon at 231-724-6705 or go to: www.shorelinecity.com. ►Make it easy to keep up to date with more stories like this. Download the 13 ON YOUR SIDE app now. Have a news tip? Email news@wzzm13.com, visit our Facebook page or Twitter.